When other California rafting trips are dry due to the drought, the Middle Fork of the American River still has guaranteed recreational water flows from the Oxbow Dam. We have recreational water releases guaranteed so we can offer great Middle Fork river rafting trips from April through September. The Middle Fork of the American River is one of the best full day rafting trips in California if not the West Coast! 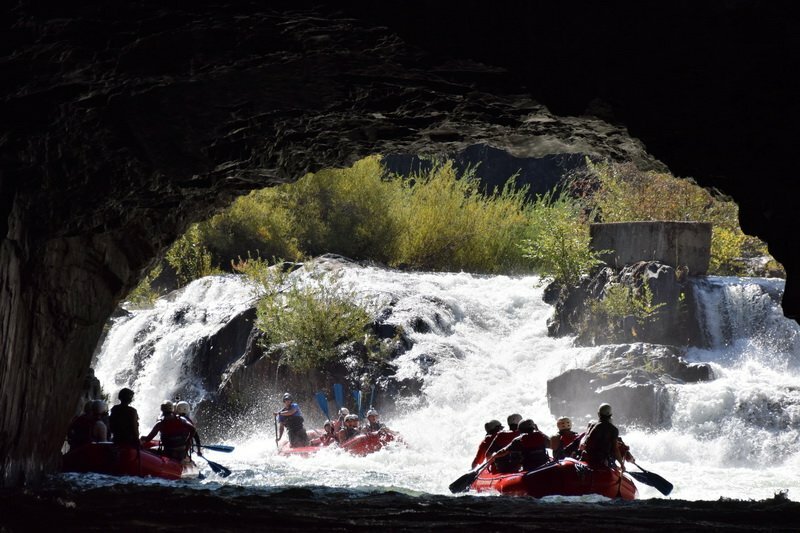 It’s a true wilderness rafting experience, secluded timeless beauty full of human history from the Gold Rush era along with some of the biggest rapids rafted in California. This stunning 18-mile section of Middle Fork of the American River was pioneered by American Whitewater Expeditions back in the 1970’s and even today, we are leading the way and setting the standard. We have the best and most experienced guides on the Middle Fork whose sole job is to make sure you have a fantastic and safe time on your river trip. The Middle Fork full day rafting trip is an intermediate whitewater river featuring big drops, lots of action and delicate maneuvers in rapids. 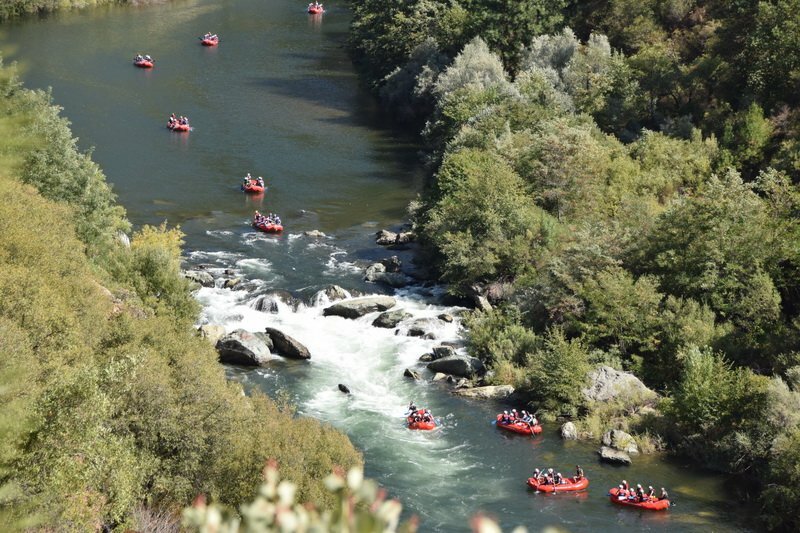 This is a perfect rafting trip for adventurous first timers and those who have rafted the South Fork before but who want even more action, seclusion and beauty. Between the big drops and fun rapids there are long calm pools where you will get to take in the sheer beauty of the 2000 foot wilderness canyon that you’re rafting through. The Middle Fork day trip has a minimum age of 12 and all participants are expected to paddle. 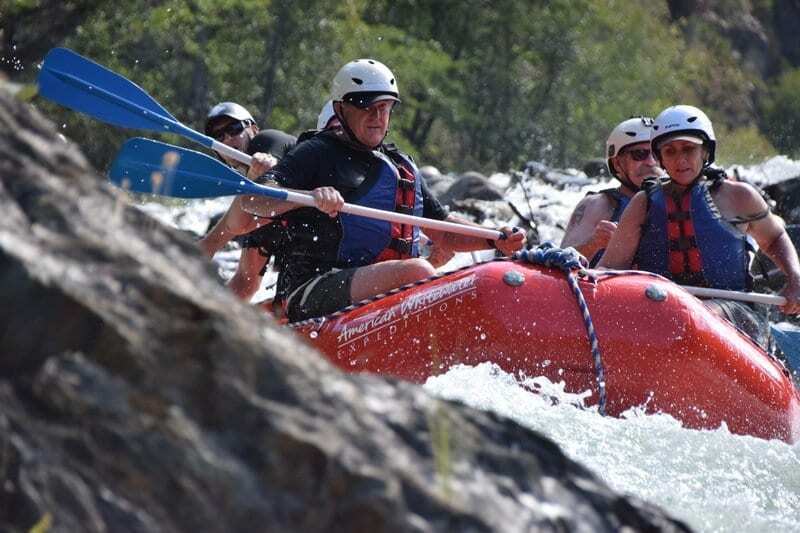 With the best and most experienced guides on the Middle Fork steering your raft you will have an extraordinary day of whitewater rafting on this world-class river. Your Middle Fork rafting adventure begins early as you head out of our River Camp at 7:30 AM for a day of thrills, challenges, and excitement as well as a true wilderness experience. There is also an option for rafters to be picked up in Auburn at 9:00 AM by prior arrangement. You can also take advantage of FREE camping the night before your trip! The drive out to the Middle Fork is beautiful, passing through the gorgeous American River canyon and past Auburn and into the heavily forested Sierra Nevada foothills. You will arrive at the put-in around between 9-10 AM and your guides will unload the rafts, get you all your safety gear and give you a detailed Safety Talk. Once on the water the action starts right off the bat with smaller Class 3 rapids. After several of the warm-up rapids you get to raft down the world famous Tunnel Chute Rapid. This is one of the ultimate in “Big Drops” commercially rafted in the US. Here the river descends 80 feet through a very narrow chute that is at most 18 feet wide! Then you’ll suddenly find yourself underground for 90 feet traveling through a tunnel blasted by the gold miners long ago. This is an absolutely amazing experience and one of only two rivers in the world where you get to raft through a tunnel! After your experience in Tunnel Chute, you continue down through impressive drops and rapids like Kanaka, Bus Crash, Mushroom, and many more. After this series of rapids we enter a nice calm stretch where you get to relax and take in the vistas of the 2000 foot high canyon walls. There is also a lot of wildlife in the canyon from eagles to river otters and even the occasional bear in the blackberry bushes! Soon a tasty deli-style lunch will be served along the river. After lunch you’ll hit more big drop and fun rapids. Walk around the Class VI Ruck-a-Chucky and watch your guides takes the boats thru with skill, precision and a degree of luck. You’ll raft down rapids like Cleavage, Parallel Parking, Drivers Ed and Final Exam! Enjoy more of the beautiful canyons until you reach the take-out between 3:00 to 4:00 PM. At take out the rafts are loaded and ice cold drinks and water is served. Then we jump in the vans for the drive back to Auburn or our River Camp in Coloma. Expect to be back in Auburn by 4:00 PM and at our Camp around 4:30 PM. You will get an opportunity to view the photos of your days rafting either in Auburn or at our River Camp. 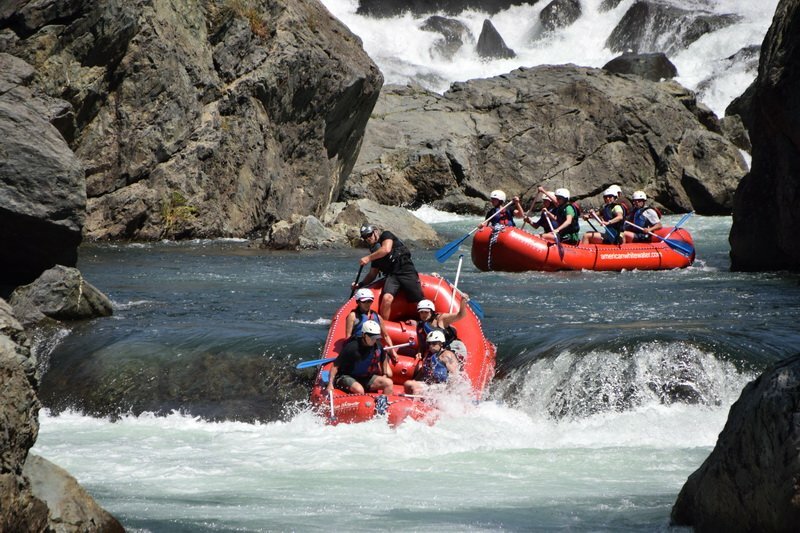 Give us a call at 800-825-3205 and let us show you an absolutely fabulous time on the Middle Fork rafting trip. Our Middle Fork rafting trip is offered every day of the week departing from our River Camp in Coloma or at our Trip Meeting Place in Auburn by prior arrangement. This trip leaves our River Camp at 7:30 AM so it’s imperative that you arrive by 7:00 AM at the latest. If you are running late please call us at 800-825-3205. Get ready for some Middle Fork rafting action! Check out our Equipment List for items you will need for your trip as well as Maps and Directions to our River Camp in Coloma as well as Maps and Directions to our Auburn Meeting Spot. Group Specials For every 5 paid rafters the 6th goes for 50% off. For every 11 paid rafters the 12th goes for FREE. Groups of 12+ call for Special Group Prices. NOTE:Prices are per person and there is an 8% Govt Land & River Use Fee added to all prices above.